that can be adopted in sizable home gardens and public parks. 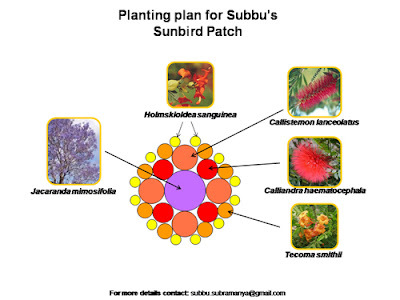 This Sunbird Corner is developed on the basis that nectar available to sunbirds is in short supply and habitually, individual sunbirds or pairs defend known sources of nectar yielding plants. Towards this, sunbirds tend to become territorial and ward-off any unwelcome `thieves'. Thus you can spend a delightful morning watching these avian beauties. The first two are trees, while the rest are bushes which when full grown, will create a four-tier system. The order of height follows the serial order. Only suggestion is that do plant the tubular hibiscus along the fence as a row of long hedge. Inclusion of Jacaranda is with a specific purpose of attracting Purple Sunbirds as they have a particular preference to Jacaranda blossoms. These plants will more or less ensure nectar availability throughout the years, even though a few are seasonal. 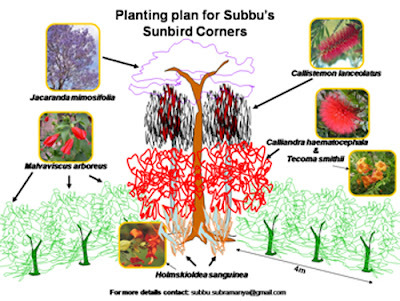 I have uploaded a diagrammatic sketch of this Sunbird Corner concept on to the files section of bngbirds (http://groups.yahoo.com/group/bngbirds/files/Subbu%27s%20Sunbird%20Corner/). There is no copyright attached to it. You are free to use it, copy, share, circulate and even include it in your websites, as I feel that this concept should be freely available to any end-user or sunbird lover who wants to adopt it. I have developed this concept for the pure joy of doing it and for the thrill of watching sunbirds from close quarters. Jacaranda Sapling can be obtained from Forest or BBMP nurseries, while rest of the plats can be sourced from most of the horticultural nurseries, especially those at Siddapura close to Lalbagh South Gate. You can also, adapt a circular design, in the midst of a lawn by planting Jacaranda in the center, surrounded by bottle brushes, red powder-puff, trumpet flower and cup & saucer plants in closely spaced expanding circles. This design is also uploaded on to the Files section (http://groups.yahoo.com/group/bngbirds/files/Subbu%27s%20Sunbird%20Corner/). Finally, I want to dedicate this concept to bngbirds that has upheld the spirit of birdwatching in Bangalore area since its inception. You are free to query me on any doubts you may have and I hope the moderators would not restrict the number of responses that this mail may attract.